The rug seemed to be a good quality rug. However the green color had a yellowish hue to it. For me, the color reminded me of green pea soup. I had to return it. Nourison Westport Hand-tufted Sage Wool Rug - 8' x 10'6"
Rug Squared Tribeca Area Rug (8' x 10'6) - 8' x 10'6"
Nourison Westport Hand-tufted Sage Wool Rug - 3'6" x 5'6"
Bring the cool, calming tones of sage into your living room ormaster bedroom with this wool rug from Nourison. A smooth bordersurrounds a waffle weave center, creating refreshing visualinterest and enhancing your space. Pair this understated rug withcomplementary colors to create a cozy haven within your home,whether you use it on hardwood or tile. Luxuriate in the high quality offered by 100 percent wool,and enjoy the subtle variations created by hand-tufting. Boundedges ensure against unraveling, and the generous size is perfectfor use in larger family areas to create a plush, invitingatmosphere. Tip: We recommend the use of a non-skidrug pad to keep the rug in place on smooth surfaces. All rug sizes are approximate. Due to the difference of monitorcolors, some rug colors may vary slightly. We try to represent allrug colors accurately. Please refer to the text above for adescription of the colors shown in the photo. I got it a day after placing the order. It looks much better than the enlarged picture of it on the web-site. The color is sage green, which happens to be perfect for my room. It has no imperfections; the textured design gives it a very rich look, which is much nicer than a plain solid color. It may be 3/4" thick, but only on the raised part of the rug and not where the texture is lower, where it is about half as thick. I am so pleased with the hue and details of this rug. 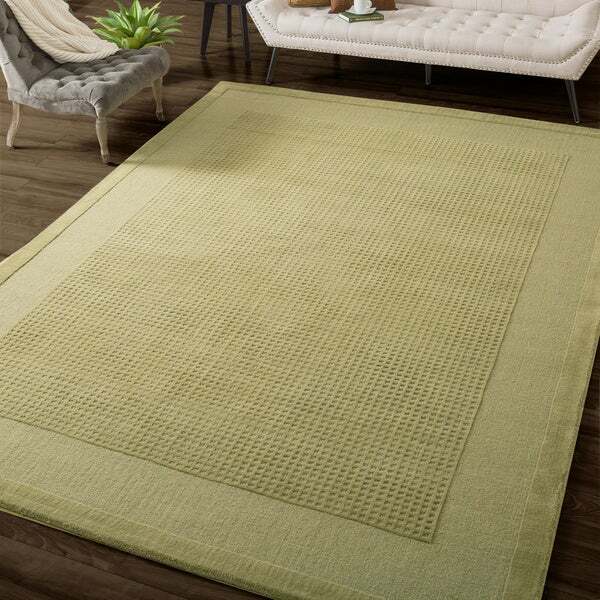 It's a beautiful color sage green and the indentations on the solid part of the rug give it character and make it look very interesting, which is great when using a non-patterned fabric. It exceeded my expectations! The rug looks great. The color matches the color on line. I bought it in beige. The only thing wrong with the rug is it sheds like crazy! I've vacuumed it numerous times and it still sheds. So for that reason I would not recommend this rug. Love the soft sage color and it goes well with my refined rustic decor! It does shed, but all wool rugs do so that's not a big deal for me as I wanted the natural fiber that wool offers and not a synthetic rug. I would definitely recommend this rug and in fact just ordered the 3 X 5. I bought this 8X10' for my dining room and it looks PERFECT under my table (which seats eight with the leaves in) with ample room fro the chairs on both sides not to 'fall off' (but a little tight with the arm chairs and the leaves on the ends). 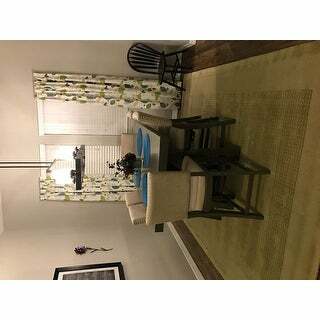 I have a formal dining room set with oak prairie style woodwork and grasscloth walls and it blends the two styles well. The cutting of the rug leaves three distinct texture areas to look at and is quite nice as it mirrors the table shape quite well. Most **** stores have the tan version on display (and sell under a different style name). The green is actually a light olive color. My walls are a ginger ale color and the furniture is mahogany. I always think that dining room colors should be similar in some way to food colors and this one fits right in! A calm oasis of sage-ish green. Quite true to color advertised, as rendered by my screen. Nice density, thickness, feels soft. No smell. Vacuum picks up a fair amount of wool fluff, which seems typical of these wool rugs. I expect the fluff will reduce over time - my other wool rug, also from overstock, did. Highly recommend. Luscious plush, great value, love the color, too! We are delighted with our new rug. After a few weeks, it still feels so plush it surprises us nicely with every step. The color is a lovely green and interestingly alters with ambient light and texture changes. Sheds very slightly but not a problem or unexpected for a new rug with our busy kitten running all over it. Very high quality wool rug for great sale price. Thanks, overstock.com! Would have like a little bit darker sage color but it was OK. For those wondering what the difference is between this rug and the Worthington runner-there is none. Same rug-same color (luckily). I took a chance and ordered both and it worked out great. I like the multi-texture of this rug and the color on screen is the color I received. I am very pleased. High quality materials and workmanship. Love the subtle pattern of the high/low tufting. Sage green color true to what was on screen. Have only unrolled it for inspection - it lay nice and flat. We have not lived with it yet-waiting for some construction to be done, but confident that it will be attractive and resilient under foot. We imagine our cats will also like it - perhaps too much. Excellent rug. The color isn't too bright but just right. Fit our dining room perfectly. We haven't had trouble with shedding like some of the other reviews. The same as the runner I purchased. My cat destroyed it within a few months. I like the sculpted design of this carpet. It sheds like a nudist at a French beach but like most wool carpets, I expected this fact. I would not hesitate in purchasing more for other rooms in the house. Beautiful thick and well-constructed rug. Love the color. This carpet looks terrific but as is true of all of the wool rugs which I purchased at Overstocks it sheds like a german shepard dog. You get what you pay for: nice design, poor quality. Sheds like crazy. Can't imagine it lasting for more than a few months. And it's wool! I bought this beautiful wool rug for my dining room and I love it. I bought one just like this before for my bedroom and it was so nice I decided to get one for my dining room! Very nice rugs! This rug has been in my front living room for a few years now. Has held up to weekly vacuuming, intermittent traffic during the year and heavy holiday traffic. Love the design, has held up with no damage all this time. Kitty hides out in the room most nights on this rug under a chair. The rug is green, not beige like some pics. Good quality. The rug was exactly as described. After keeping this rug, it began to shed and to pick. So sad. "does this rug have latex backing?" It does not have a latex backing, its a good weight depending on size so should not move, I love this wool rug, good value for the price! 100% wool, color, size, positive reviews, price. Saw the rug at a big box store, and it is beautiful. Your price was even better than their sale price. The color, style and reviews. "The description says "green". But the photo looks brown. What color is it actally?" Hello babs24, This is more of an olive green. Some computer monitors show a different color. Thank you for shopping with us! I just got one a couple of weeks ago - I'd say a lighter olive green.